BlackDog Letterpress: "Suzanne Powney is a book artist and letterpress printer, founder of BlackDog Letterpress in 2001. She learned her craft from master printers who ran the print shop at the Museum of Printing History in Houston, Texas. She went on to get her MFA in Graphic Communications from the University of Houston while also working as a lecturer teaching letterpress to the undergraduates. She feels with the leaps in technology and the speed of results of on demand printing, there lies a tactile disconnect that she has found in the art printing wood and metal type. She is always investigating the traditional craft of letterpress and book arts as she works in the current technological driven graphic design world. Her work is about tactility and why we are drawn to intimate objects, through images and words." Starkville, Mississippi: BlackDog Letterpress, 2017. Edition of 48. 5.75 x 8.75"; 52 pages (including 12 foldout pages). Printed letterpress on Cranes Lettra with Caslon Oldstyle using a Vandercook 4T. 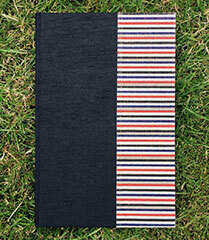 Sewn binding with paper over boards and quarter cloth. Titles printed on front board. In matching cloth slipcase. Signed and numbered by the artist. Artist Statement: "Assistant Professor J. Suzanne Powney of Starkville has been awarded a $500 grant from the Mississippi Arts Commission (MAC). This grant is a portion of the grants the Commission awarded in 2016-2017 and will be used to create a series of artist books on the interaction of color in letterpress. The grants are made possible by continued funding from the Mississippi State Legislature and the National Endowment for the Arts. 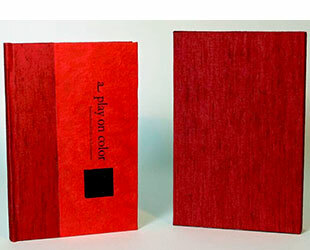 "The book A Play on Color: Interaction of Color in Letterpress is an investigation of letterpress prints, in honor of Josef Albers' book Interaction of Color. The images are directly inspired and reinterpreted based on the pages of the 50th anniversary edition and from viewing the original screen prints. The play of color and perception are a beautiful treatise on color theory. 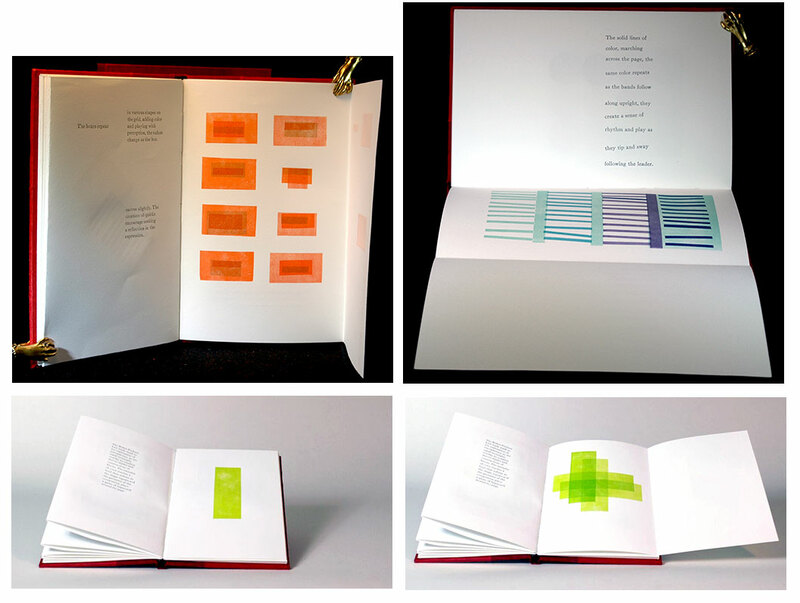 The artist added text as commentary as the book unfolds to reveal the composition in color." Starkville, Mississippi: BlackDog Letterpress, 2015. Edition of 12. 5.5 x 8.75"; 14 pages including pastedowns. Letterpress printed on Cranes Lettra paper with Caslon Semibold and Franklin Gothic Condensed and found wood type. Printed on a 4T Vandercook. Bound in paper over boards with black book cloth. Slipcased in matching black cloth. Numbered. Suzanne Powney: "The prototype for A Manifesto developed at Penland, NC as a part of a workshop delving into my personal core values. The edition of 12 printed in Starkville, MS explores craft, tactility and collaboration. For me, the book has three parts that come together around the hand, head and heart. The hand being letterpress craft and making physical connections, the head with connecting ideas with each other through words and the heart being through community and a shared experience. The words play across the pages with images that relate to the three core principles. All three come together around touch."